Every year, about 12 million Americans head to their doctors with “impacted or excessive cerumen,” which means their ears are just full of earwax. All those checkups lead to about 8 million yearly earwax removal procedures performed by medical professionals (a.k.a. not the ear candle specialist at the salon on the corner), according to the American Academy of Otolaryngology–Head and Neck Surgery. The purpose of earwax really is to keep your ear canal clean. While excess, hard, or obstructive earwax can be problematic, most earwax (cerumen) is much more beneficial. It is a normal, protective coating for the sensitive skin of the ear canal. A canal coated with ear wax will repel water and help prevent external ear infections. Not only does earwax help to keep dust and dirt away from the eardrum, but it also provides some antibacterial and lubricating perks. For most people, the ears are self-cleaning. Once earwax dries, every motion of your jaw, whether chewing or talking, helps move the old earwax out of the opening of your ear. When you dig it out with your cotton swab you leave your ear very vulnerable. The more you rub the skin of your ears, the more histamine you release, which in turn makes the skin irritated and inflamed just like how that mosquito bite gets itchier the more you scratch it. Plus, because of the lubricating nature of earwax, removing it can simply make your ears drier, motivating you to keep sticking swabs in there in a mistaken attempt at relief. 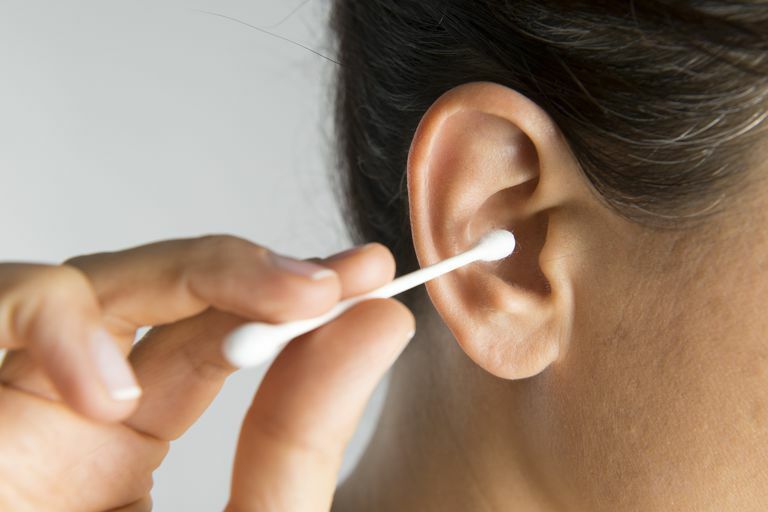 Cotton swabs (commonly called "Q-tips") are frequently the go-to choice used to clean the wax out of the ear canals of people, which initially seems like a good idea unless you understand the anatomy and physiology well. Only the outer one-third to one-half of the ear canal makes cerumen (wax) which functions to moisturize the skin and help prevent foreign bodies from entering deeper into the ear canal. The body also has hairs and the natural growth of canal skin is from the inside out, so it is normal for cerumen to (very slowly) "flow" out of the ear. When people use cotton swabs they frequently clean out some of the wax, but also push some of it back deeper into the medial canal which cannot remove it well. It can get pushed up against the tympanic membrane (eardrum) and cause impactions that can impair hearing, can lead to infection and can be painful/difficult to remove. Think of a cotton swab like the plungers used to load cannons. They can pack softer wax deeply in the ear canal against the eardrum. By creating a formidable plug and preventing the eardrum from moving normally, it is quite easy to cause some significant hearing loss. Water can also be trapped behind these self-created wax dams and you may hear the water moving around in the ear. The eardrum is very delicate, so you can puncture it with a cotton swab. As if a punctured eardrum isn’t enough of a deterrent, if you touch the eardrum you may press on the little bones of hearing underneath — the hammer, the anvil, and the stirrup (incus, malleus, and stapes). They’re the tiniest bones in the body and they’re right under the eardrum, attached to it. And if you press on those, it sends vibrational waves into the inner ear (remember, the inner ear is responsible for hearing and balance). So, if you tap on the eardrum, you’re sending shock waves into the inner ear and can cause problems with your hearing and balance. When this happens, the ear will need to be lavaged — washed out by a gentle stream of warm water. Or, you will need to see your audiologist or physician, someone who can look inside your ear and remove the impaction professionally. Soften the wax. Use an eyedropper to apply a few drops of baby oil, mineral oil, glycerin or hydrogen peroxide in your ear canal twice a day for no more than four to five days. Use warm water. After a day or two, when the wax is softened, use a rubber-bulb syringe to gently squirt warm (body temperature) water into your ear canal. Tilt your head and pull your outer ear up and back to straighten your ear canal. When finished irrigating, tip your head to the side to let the water drain out. Dry your ear canal. When finished, gently dry your outer ear with a towel or a hand-held hair dryer. You may need to repeat this wax-softening and irrigation procedure several times before the excess earwax falls out. However, the softening agents may only loosen the outer layer of the wax and cause it to lodge deeper in the ear canal or against the eardrum. If your symptoms don't improve after a few treatments, see your doctor. Earwax removal kits available in stores also can be effective at removing wax buildup. If you're unsure which one is right for you, ask your audiologist for advice on how to properly use other earwax-removal methods. AAO-HNSF Clinical Practice Guideline: Earwax Removal (8/29/2008). American Academy of Otolaryngology- Head and Neck Surgery. Klein, Sarah. "This Will Make You Never, Ever Want To Clean Your Ears Again" (7/21/2014). The Huffington Post. What Are the Auditory Ossicles? How Does Cholesteatoma Cause Hearing Loss?